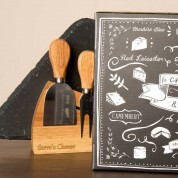 This stylish presentation gift is perfect for any cheese lover in the family. It will become the centre piece of the dining room or kitchen table. 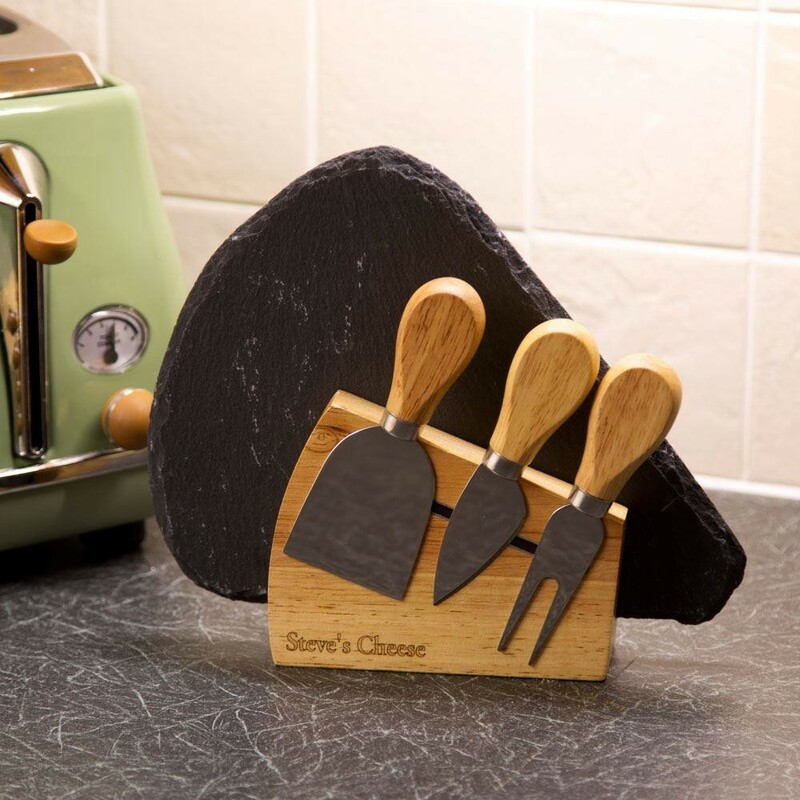 The slate cheese board is shaped like a wedge of cheese and is perfect for cutting those fine cheeses and displaying grapes, pate, chutney and biscuits or crackers on the side with a glass or two of wine. 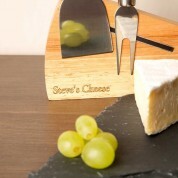 The front of the wooden display has a magnetic strip to stick the 3 cheese cutting tools on to the front. (Fork, knife and a slicer). *Flat cheese knife (cutting crumbly soft cheese or shaving, chopping and cubing fine cheese), cheese fork (ideal for breaking hard, aged cheeses or softer, crumbly cheeses), small spade (cut or chunk wedges of hard cheeses). 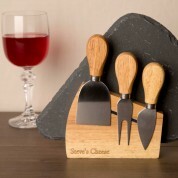 Perfect for house warming gift, best friends birthday, Christmas gift for dad or anniversary gift or any other occasion. We engrave the wooden holder in house so any recipients name can be added to this special gift. 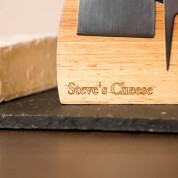 Why not add some of the recipients favourite cheese or some biscuits to add an extra touch to this personal gift. 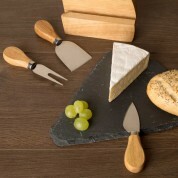 Dimensions of cheese board: 23cm x 18.5cm x 0.5cm. Dimensions of wooden holder: 13cm x 10.5cm x 4cm.